I like this so much! It is convenient and comfortable. My neighbor ordered one also because she liked mine! One of the things I use my Bandi for is to have my phone with me when I’m working in the yard and I have no pockets. Great idea! I bought several of these for myself, my daughters and my sister. Purchased the blue and black ones. We are all pleased. Handy for jogging, going to the gym and even work (one of my daughters is an ER nurse). All the different size "pockets" are good for keeping change, IDs, phones, etc. each in their own space. Good idea! Easy to wear and easy to use. Holds my phone and key when I walk the dog. Looking forward to using it on hikes and for travel. This will make our trip to Rome in May. My daughter and I are going to Rome and this will be nice to carry passport, credit cards, money and It'll be very close. No purse to worry about. We each will have our own. They are very soft and nice to have next to your skin. This is the best. I don't carry a bag when I walk my dog and would end up leaving my cell phone home because I couldn't hold my phone and clean up after my dog. Now with the bandi I'm able to have the security of knowing I have my phone on me in case a situation arises when I need it. I bought this to use for my insulin pump. It is perfect. I especially like it for sleeping ... pjs and nightgowns just don't have pockets and it works like a dream. I love that it has a pouch and it won't fall out. It will also hold my testing equipment. Super comfortable. I kept looking down to make sure it hadn't fallen off! It held, IPhone, cars and cash without making a bulge. 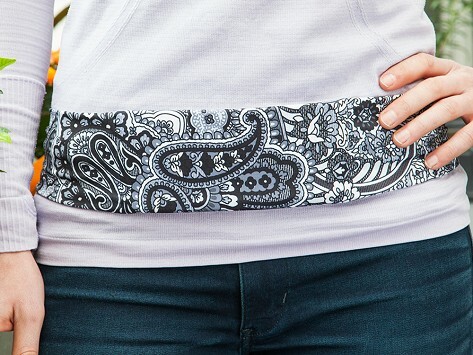 Comfortable and practical adjustable belt great for my long walks and running errands. This is a perfect solution to travel and keeping your important items close and concealed under clothes. Bought for myself and three sisters for upcoming European trip. Nice to know credit cards, phone, and cash are safe and easy to retrieve when needed.